Anyone seriously bitten by the Hallyu bug lives and breathes K-pop and K-dramas, K-fashion and K-beauty—and if they could turn their K-obsessions into work, they’d never work a day in their lives! Get ready to get jealous—the Pinay you’re about to meet is doing all that and more. 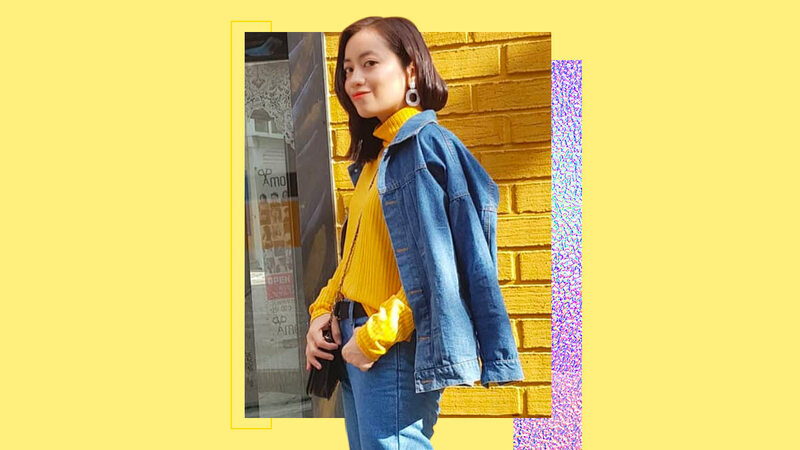 Dianne Pineda-Kim is an editor and writer covering Korean pop culture in Jeonju, South Korea, where she lives with her Korean husband, Seong Jin. The formerly Manila-based writer has continued penning pieces for Philippine outlets, particularly for local platform Snippet, but most of the online and print titles she writes for are Korean, such as the Seoul-based 10 Mag Korea and Groove Korea, the Korean government-supported magazine Jeonbuk Life, and last but certainly not the least, Soompi—aka your go-to guide to everything K-entertainment! Recently, she covered Seoul Fashion Week (SFW) not just for the Korean titles she writes for, but also for CNN Style—girl’s legit. What were you doing professionally in the Philippines before you moved to South Korea? I graduated from Ateneo de Manila with a degree in AB Comm and minor in Philosophy, and since then I’ve always been writing. I did some copywriting and scriptwriting jobs for event and ad companies, but what got me started in publishing was when I got accepted into the editorial news staff of the Philippine Daily Inquirer. I found myself more drawn towards writing lifestyle and human interest stories, so I transferred to Inquirer’s sister print magazine company, Hinge Inquirer. I lasted more than five years there, thankfully, ending my stint as a brand editor for Northern Living and Southern Living magazines. Then I moved on to the now-defunct Hola! Magazine, which for me was a really fun two years. But times were changing and so was the print industry, so unfortunately, the magazine folded and I had to “reinvent” myself—and fast. That’s when I started “going digital”—the catchphrase at that time—and worked as an editor for a travel website, a social media manager, and a copywriter for a Singapore-based digital marketing and automation company. I also did some styling gigs on the side. Eventually, I decided to do remote work since everything can be done online. How did you get into writing about Korean pop culture upon moving to Korea? I moved to Korea in December 2016 not to pursue a career in the publishing industry here, but because I got married to my Korean husband, whom I had met in the Philippines. As with any decision to move to another country, the adjustment period was quite difficult for me, career-wise. I had to leave not only my family and friends, but the thing that I’ve been doing all my life. Korea wasn’t exactly looking for English language writers; what they needed were English teachers. I tried teaching English to small kids in a small hagwon (English academy), but it just didn’t feel right. So I quit after about three or four months. At that time I didn’t want to just do nothing and stay at home all day, so I knew I had to do something, at least. I would submit applications to Korea-based publications, but they would often require professional Korean-to-English translation skills (of which I had none). I just kept on looking. I got a few writing gigs here and there (mostly Korean fashion and online shops that require English copy), until I got in Soompi and the other publications. I have a book coming out spring of 2019; it’s a K-pop styling book produced by Skyhorse Publishing from New York. I worked with two creative studios from Seoul and Manila, one international photographer from Seoul, and Korean models and foreign expat bloggers/influencers living in Seoul. I'll be putting more details in my Instagram, so if people would like to know more about it, they can just hit follow @dianne_panda. Had you always been interested in Korean pop culture even back in the Philippines? Yes! Not gonna lie, I was a K-pop fan back when it was considered “uncool.” It was hard to get any K-pop or K-drama content back then unless you bought merchandise from online sellers. The year 2009 was the first time my best friend and fellow editor RJ Roque and I went to Seoul to travel and watch Dream Concert—so-called because it gathered all the biggest K-pop groups (Girls’ Generation, SHINee, T-Ara, TVXQ, 4Minute, etc.) in one stage. It blew us away. After that we would often come back, sometimes together, sometimes with other friends. My love for K-pop is on the same level as my love for Korean fashion. Around 2011 or 2012 was when I first watched Seoul Fashion Week with editor friends from Manila, and it was an incredible experience. I didn’t think I’d still cover SFW until now, this time for Korean and international publications. The Korean models I’ve seen who got their break in runways are now actors and actresses in K-dramas: Nam Joo Hyuk, Lee Sung Kyung, Jang Ki Yong, Joo Woojae, Do Sangwoo, to name a few. The recent SFW was my busiest yet because I did coverage for CNN Style and all the sites I’m currently working for. I also met Richard Juan then, and we ended up doing an interview for Snippet. Has being a Filipina ever had an impact on your career journey in Korea? Whenever I say I’m from the Philippines, Koreans would often say that Filipinos are known for being good at speaking English. Korea has been so good to me, I haven’t really had any huge negative experiences, except that one time when I went for an interview for an English teaching job. When the hagwon director met me, he said he was surprised that I was a Filipina because based on my resume and writing portfolio, he thought I was American! He admitted that he couldn’t hire me full-time—most hagwons prefer native English speakers, plus points if you’re from their preferred countries—but because he thought I didn’t have a Filipino accent, he could hire me as a teaching assistant with a lower wage. He said Asians normally get lower salary than western foreigners. I never responded to his calls after that day. How similar or different is your life as a writer and editor in the Philippines compared to your life as such in Korea? Quite different! In Manila, having spent years in the industry, things would often come so easily for me. I can just call or text PR companies and brands for information, invites, and photos. I don’t even have to call, actually—they would just send them to me regularly. I can easily borrow clothes or accessories and book locations for shoots. But what I do miss most is working with the creatives in Manila. Everyone is up for collaborations. They go all-out with their creative vision, no matter how crazy or difficult it can be. The atmosphere on the set is always characterized by friendly banter. Shoots in Manila often feel like we’re playing and hanging out with friends. In Korea, you always have to act and talk professionally. Age and seniority are also important factors you have to consider when it comes to addressing the people you work with. But for me, it’s always good to learn different ways of working and adjusting yourself depending on the situation. What are your most memorable experiences on the job in Korea? Definitely interviewing Korean fashion designers and seeing celebs I’ve admired for a long time in person, and finding out that they’re very humble and nice off-screen. I was also able to cover a forum that included some of the best journalists in the world: CNN’s Anderson Cooper, BBC’s Robert Kelly, among many others. I was also able to interview Han Hyun Min, the first Korean-Nigerian model who made it big as a fashion model in South Korea. Do you still get excited about Korean pop culture even though you've been covering it and consuming it for work for a while now? Of course! I don’t think I’ll ever get used to seeing Koreans who are prominent in music, drama, or fashion. So far, the most starstruck I’ve felt was when I saw 2NE1 (when they were still active), Jay Park, Red Velvet, the fashion models I mentioned earlier, Ahn Jae Hyun, EXO, and Girls’ Generation members sitting across from me; and meeting mega-influencers Aimee Song (whom I’ve been following since 2010! ), Irene Kim, Soo Joo, among many others! What common misconceptions do people in the Philippines have about your life in Korea, and what is it really like? Most people think it’s all glamorous and like a K-Drama come to life. I don’t really do things for fame or fortune, I’m far from it! It’s work, first and foremost. In previous SFWs, the other writers and I would be stuck in the press room all day writing after watching a show. This year, I spent the whole night at a PC rental shop until 1 a.m. and went there again early the next day at 8 a.m. because my laptop had broken down and I had to send my articles before and in between fashion shows! I also used to get DMs in my Instagram asking not just how I got my work, but also questions like “How did you get a Korean oppa?” It’s funny. We don’t live a K-Drama life filled with grand romantic gestures. I didn’t marry my husband because I love K-Pop or just so I can move to Korea. How have you been adjusting to life in Korea in general? Learning the Korean language is really important here. Right now, I can understand more than I can speak and I need to keep learning, because I really think it’s not only necessary to get by, but also you need to integrate yourself within the community. We have a lot more in common with Korean culture than we think, especially when it comes to family values. But one thing I had to be mindful of is always being on time. “Filipino time” is something that is not acceptable here—actually, it shouldn’t be anywhere else. My husband has been supportive of all my creative ventures—he would take photos and videos for me, drive me to shoots, carry my luggage, take my OOTDs, he’s the best! He never asked me to change my career. In fact, he would often encourage me to make my own platform and not always make content for others. I’m not quite ready yet and I don’t think I’m a blogger/vlogger material (and I’m forever awkward in front of the camera), but I don’t want to say never.